"I guess I'm one of the lucky kids today!" 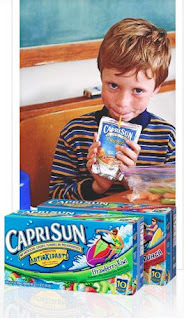 Remind me to add deprivation of "juice drinks" to the scourges suffered by children of the world. And of course, the only reason I bought Capri Sun today? Part of a sweet Catalina deal at Jewel, so it was less than $1 for a 10-pack. Yeah, I picked up 8 boxes, plus 2 easy mac and a gallon of milk for $8. Ohmygod, the links are heartrending.. Such a deprived child you have! :) I love the comparisons they make to other people. And I remember doing the EXACT same thing as a child!